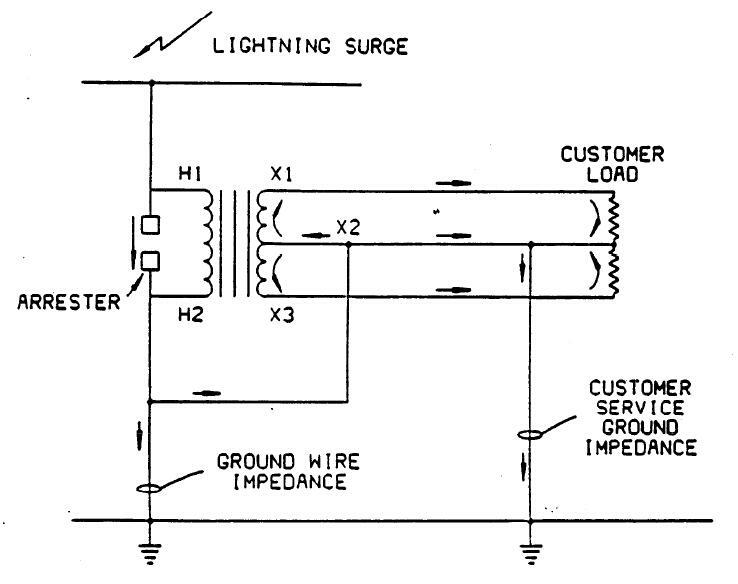 Single-phase distribution transformers using non-interlaced winding designs are as much at risk from lightning surges entering through the secondary neutral (X2) as from primary surges. As illustrated below, the voltage induced across the primary winding in total is small, but very high layer-to-layer stresses can occur within the transformer winding. Extensive DSTAR testing and analytical investigations have produced guidelines for minimizing risks of transformer failure from this phenomenon, also guidelines have been provided for coordination of the transformer protection with customer-side overvoltage protection. The objective of this project was to perform a parametric study (with a detailed system model) to develop performance guidelines and identify ways of minimizing the effects of secondary surges on distribution transformers. The effect of secondary surges was quantified in terms of the first layer voltage. A limit of 30 kV was used for both interlaced and non-interlaced transformers. This study took into account items not previously addressed in the literature including: 1) the effects of meter gaps with a wide range of sparkover voltages and 2) conditions necessary to obtain unbalanced secondary surges. The results of the parametric study were used to develop a spreadsheet in which the probability of exceeding 30 kV on the fast layer is estimated taking into account: distribution line location (rural or residential), pole grounds (25 ohms to 100 ohms), transformer size (10 or 2.5 kVA), and variation of the X2 transfer impedance. Surge currents in the secondary side of a distribution transfomer.